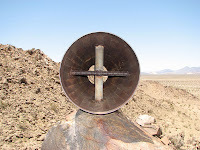 This summer I ventured into the Mojave desert with some friends to visit the famed "Mojave Desert Megaphone" and a few other odd things located nearby. I was joined by Mark and his dad who drove his Honda Ridgeline truck. The Ridgeline had a suspension lift and is a much more capable off road vehicle than my stock Acura MDX. 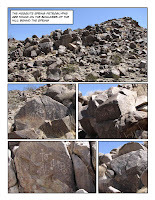 I learned about these interesting places from Bill Mann's book "Guide to 50 Interesting and Mysterious Sites in the Mojave" Vol. 1. 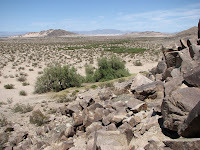 Bill has authored several books about strange and historical things in the deserts of southern California. Even though I had a hard time finding a website with photos of the books (here's one), they are easy to find at major book stores. It looks like plenty of people visit the desert megaphone because googling it yields several hits. We started at the Basin Road exit off I-15 south of Baker and drove down the dirt road to the railroad tracks where we turned east. The road that follows the tracks gets a little sandy in places. Our first stop was the grave of Delores Holland. 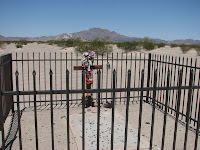 I've seen many grave sites in the mojave desert and this one is the best maintained. The grave is just north of a stand of Athel trees on the north side of the tracks at the location of the old King watering stop. The story goes that Delores was the child of a railroad worker at King. She died as an infant in July 1931. Here's a Google Map of the location. You can see the grave site for its rectangular border in the clearing to the upper left of the trees. In my photo, you can see Cave Mountain in the distance behind the grave. 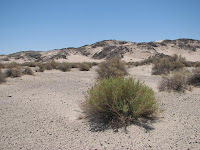 Athel trees and tamarisks (both saltcedar variants) were planted in the desert by the railroads to help block blowing sand from covering the tracks. They are both from the middle east and are now considered invasive species. Our next stop was the old town of Crucero, which is no more. 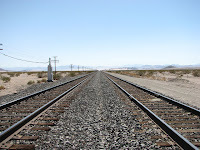 Crucero was a watering stop at the intersection of the Southern Pacific and Tonopah and Tidewater railroads. Here's a Google Map of downtown Crucero. My photo shows no signs of those streets shown on Google's map. The place was really desolate and depressing. I can't imagine living there. I read that telegraph operators at Crucero had nicknamed the place "Rattlesnake Flat" due to the "carpet of sidewinders that covered the ground at night." 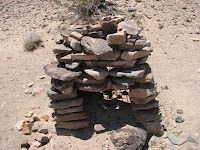 We headed to the east of Crucero to find an oddity called the rock igloo. Along the way the road became very deep with sand. It was the closest I've come to getting stuck. The Acura MDX is a great SUV, but it's horrible in sand because you want to drive between 20 and 30 mph to keep up your momentum, however the computer will disengage the center differential once you're going faster than 18 mph. Practically speaking, that limits me to sand that's less than about 4-6 inches deep. I ended up stopping and radioing the guys that I needed to find a way off the road. I got out and found a parallel road that was much better. In fact, it had old pieces of asphalt. Mark and his dad helped me to get my car across 40 feet of desert to the better road and I was a happy camper. 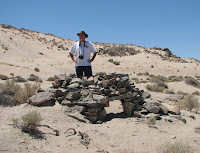 In the photo, Mark is standing in the remains of the mysterious rock igloo. He's posed like a giant who has just defeated the liliputian villagers, surveying the spoils of his victory. Bill Mann's photo showed it to be intact, and he reported that in 1998 you could still crawl into it. Maybe it had significance to the local indians, or maybe it was made by the kids in Crucero. The rock igloo is located at the center of this map. This area is riddled with tracks from ATVs and such. Right in the middle of one such track, the BLM had posted a sign prohibiting motorized vehicles. For the next stage of our adventure, we returned to Crucero and turned south. 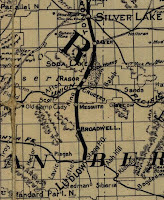 The small map is cropped from this large (6 MB) map of the T&T Railroad in 1907. It shows their main line running north from Ludlow through Crucero, as well as the many water stops along the routes. We drove the sandy road south following the route of the old T&T line. The rails and timber are long gone, leaving the sandy overgrown berm that was the railbed. this area was devastated by floods in 1916, 1933 and 1938. Flood repair costs along with reduced traffic due to the Great Depression led to T&T's demise in 1940. The line between Ludlow and Crucero was last run on October 8, 1933. 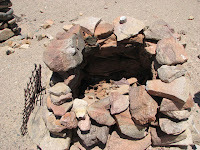 Three miles south of Crucero we found the "mystery furnaces" described in Mann's book. They're not in good condition and a few appear to have been thoroughly destroyed. 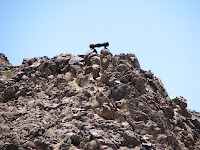 It took us a while, but we finally found the Mojave Desert Megaphone, which was our primary goal for this adventure. This is very strange. 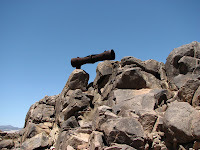 At some unknown time in the past, somebody bolted this 6 ft long metal thing to the rocks on a small hill. Bill Mann couldn't discover its history and we could learn no more with the all-powerful Google. There were once two railroad water stops nearby (Mesquite and Broadwell), so maybe it was put there by railroad workers. It's GPS coordinates are: latitude 35.0054 deg, longitude -116.1964 deg. Google's satellite imagery in that area is very poor so I won't post a link to a map. We stopped off at Mesquite Spring to rest and eat. You might never find the spring, if you didn't have directions. This was once the site of a large indian encampment, due to the year-round availability of water. Mark set off to find the actual spring and inspect the water while I hunted for the petroglyphs on the hill of rocks behind the trees. The spring is located down amongst those Athel trees in the photo taken from the rock hill. The petroglyphs are in pretty good shape, probably because the remoteness means very few people visit. 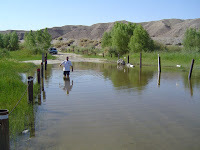 On our return, we attempted to drive through Afton canyon but were stopped by the high water. The Ridgeline could probably make it, but I didn't think my MDX would. Before we left the canyon, we stopped a few times to explore some of the side slot canyons. All in all, it was a fun day in the desert. 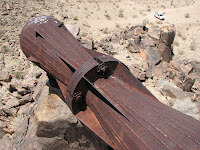 UPDATE: I recently visited the Mojave Megaphone site taking a different and more difficult route. See here for details. UPDATE: I recently returned to the Megaphone taking an easier route. The post is here. it's funny to see people not understanding what this is. the "megaphone" and it's origins being something of a bed time story for me growing up. and just now finding out that there are websites dedicated to what this is for and where this came from and how it got there. Amazing! I've been told that I'm not aloud to tell the funny story, but i will say that it's been there since the early 1970's and "megaphone" is close but not it's function. You have to realize it's MISSING PARTS. OK After some further googling, I think it might have been a drum. And the drum heads are missing. I would really like to talk to streeteracer. I am dedicated to the history of the entire Rasor Road, Curcero, Afton Canyon, Ludlow and Devils playground area. I too have heard that someone made it to be a drum, but the current name for it is the megaphone. I have tons of history on my site if you would like to view it. I also own property in that area and my buddy owns the oringinal Rasor Ranch where the water stop was for the T&T. Streeteracer, please go to my site and email me. Thanks buddy. Street Racer, what is your website? You can also email me at Keith@RasorRanch.com / I am trying hard to locate and preserve the history of this area of the desert. Thanks. i'm naming it "handgun hill" huh???? Was at the MegaPhone and from my ground I itis an early modle of a liquid rocket motor. Has anyone ever tested the "iron" used in it's construction? Is it exotic or ??? Felicitaciones, espero puedas continuar con este Intento de preservar las tradiciones de estos remotos lugares. It definitely looks like a ram jet nozzle. It doesn't look like a drum or megaphone. The cross in the center is added on doesn't look light a sight just like an add on later. Maybe for stability or transportation.